Nowshera voters tend to vote for a personality rather than for a party, which is why the big names count. Some people say, however, that the PTI is generally considered ahead in popularity compared to the ANP and PPP. 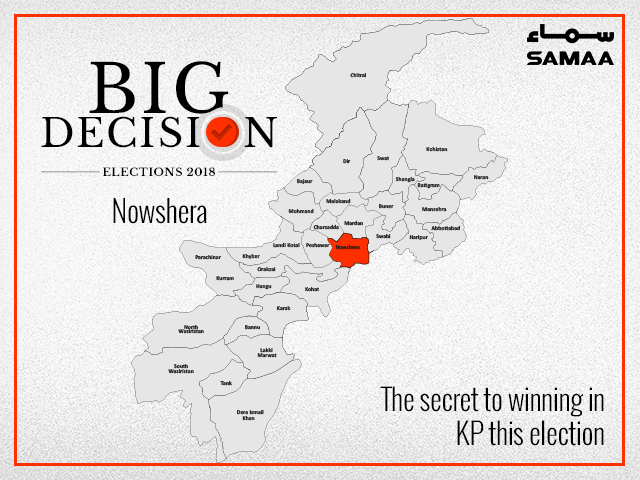 As Nowshera is considered a stronghold of the PTI which is why the ANP’s strategy is to try to grab as many undecided or floating voters as possible. But it looks like the independents will be deciding the election. From NA-25 the strongest name is Pervez Khattak on the PTI ticket who is facing Syed Zulfiqar from the MMA. From NA-26, the PTI’s Imran Khattak is taking on the ANP’s Jamal Khattak. On PK-62, Khalil Abbas from the ANP is up against M. Idrees of the PTI. In PK-63 Mian Jamshid-ud-Din is on the PTI ticket while PPP leader Liaqat Ali Shabab is supposed to get a good crowd. Ikhtiar Wali from the PML-N is expected to corner the MMA votes. From PK-64, there is Pervez Khattak (PTI), M. Shahid (ANP). From PK-65 we have ANP’s Mian Iftikhar who is a big name. Up against him is Khaleeq ur Rahman of the PTI and Daud Khan of the PPP. Pervez Khattak is standing on two PK seats and one NA seat, making him a strong candidate. But the ANP’s Mian Iftikhar is also in the field and he is also a towering personality.